THEN: The view looks east on King Street from near Occidental Avenue South. Courtesy MOHAI. A recent view from 2009. Jean Sherrard. The Great Northern RR Depot opened Wednesday, May 9, 1906 – sort of. Neither the interior’s marble furnishings nor the umbrella sheds beside the tracks were completed; debris covered the floor of the waiting room; the walks and driveways approaching the station from Jackson Street were weeks from being paved; and the first train was hours late. 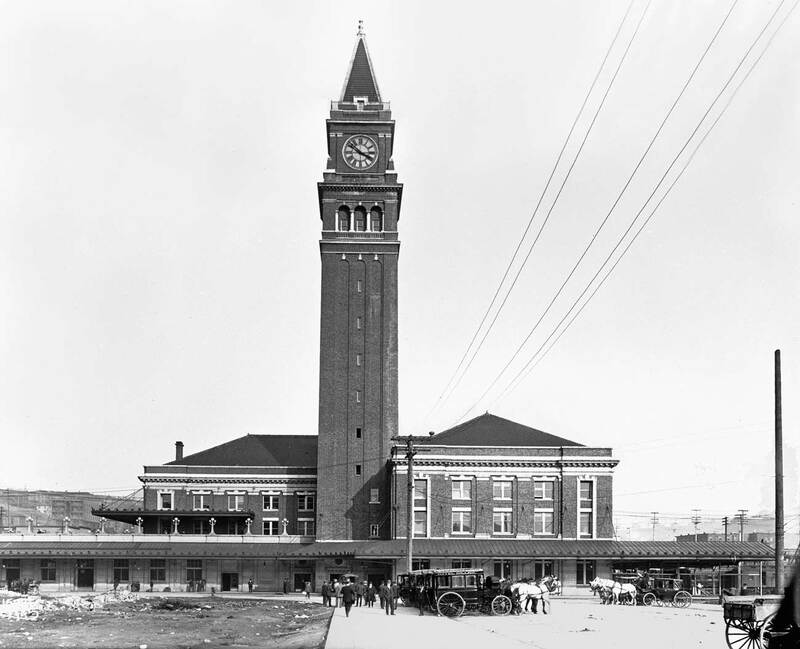 The great “empire builder” James Hill took 13 years to give a proper station to Seattle, the western terminus for his Great Northern Railroad, which came the northern route across the plains and came over the Cascades through Stevens Pass. Previously, the railroad’s temporary stations had been moved about the waterfront from shack to shack, as were the Northern Pacific’s. Beginning in 1900 they shared a frame structure at the waterfront foot of Columbia Street. With eight sets of parallel tracks, Railroad Avenue (now Alaska Way) sometimes resembled a congested Interstate 5, although it was not in such a rush. The device that relieved the waterfront congestion and made it possible to have a grand terminus was the tunnel that the two transcontinental railroads built together beneath the city. The boring began in 1903 and the station building in 1905. The architects for the latter were the St. Paul, Minn., firm of Reed and Stem. (Eight years later they designed the Grand Central Station in New York.) For the most part, their neoclassical structure here in Seattle was built with local materials – bricks from Renton and granite from Index. The marble came from Vermont and was late in arriving. 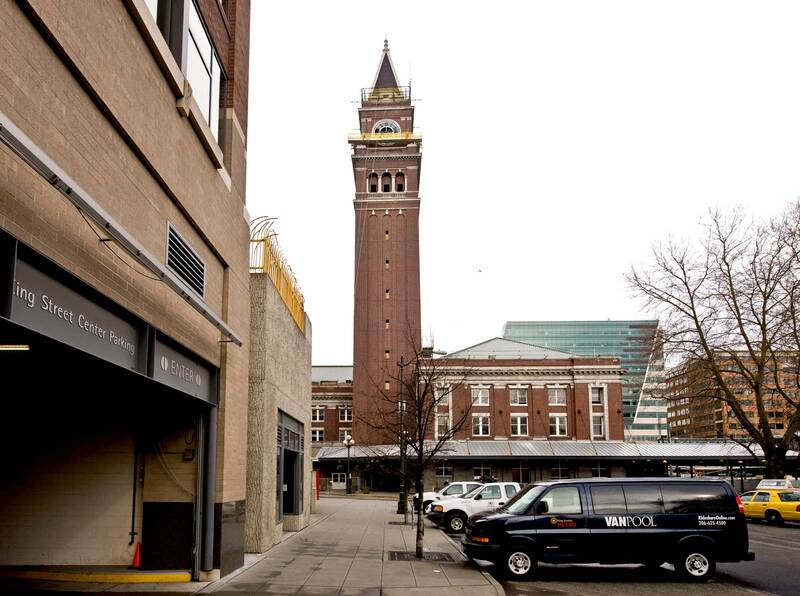 The best view of both the King St. Station Campanile Tower and Union Station is from the east side of 5th ve. below Jackson St. You can examine the astonishly tiled roof of the twower from there. It only took them two years to build a sturdy tunnel all the way under downtown? They did it a century ago? What the heck kind of scam is this Bertha thing?